Another nail in the coffin for the incredible statement made by the Local Government Association (LGA) to MPs that the “closure of a library does not automatically mean a decrease in access to library services“. Recent figures from Brent show a 20% drop in usage, 104,000 fewer visits and 129,449 fewer books issued since it decided, against gigantic massive opposition, to close six (even seven) of its twelve libraries. The LGA made its statement in its submission to the Select Committee Inquiry into Library Closures. Let us hope that the MPs on that committee notice the basic fact that, duh, closing libraries does equal less usage. Withdrawing funds from libraries does mean less visits. Reducing the bookstock does mean less borrowing of books. Refusing to intervene in the library cuts, Ed Vaizey, does mean more libraries will get cut. In fact, of course, it’s not a duh moment. Regardless of how they may come across, Ed is no that much of a (hard of hearing) Homer Simpson. In fact, he and the LGA know perfectly well the truth. They just think that, given the need for massive cuts, public libraries are not important enough to save. It is up to us, who realise that they are, to make sure that they don’t get away with it. Print is not dying – as reported in the Guardian. Leicestershire – Opening hour cuts at Market Harborough, Lutterworth, Broughton Astley, Fleckney, Kibworth and Great Glen. Staffing cuts achieved through natural wastage. Shropshire – 2 mobiles taken off road. Moving towards more one-stop shops in branches. Thurrock – 6 libraries (Aveley, Corringham, Stanford, Chadwell, Blackshots and East Tilbury) identified as potential asset management sell-offs but council denies that they will be closed so not counted as under threat, yet. 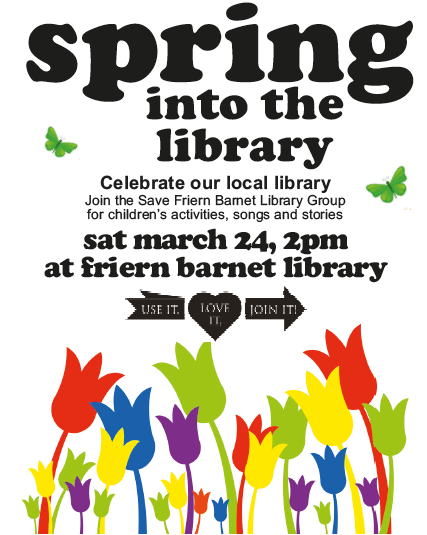 Barnet – A tale of two Barnet libraries – Broken Barnet. Saving library reject “after a year of campaigning by highly committed members of a local group, (see above) on various spurious grounds, including the inability to provide any further funding. The reasons given are irrelevant, in fact, because of course the intention has always been to close the library so as to free the building and grounds for sale and development.”. Hampstead Garden, though, in Conservative ward gets “all necessary support until at least 2016, or as long as the volunteer suburbanistas do not get bored with playing librarians”. Brent – Number of visits to Brent libraries plummet by thousands – Brent & Kilburn Times. Figures obtained through a Freedom of Information request reveal that in the five months after the libraries closed, there were nearly 104,000 fewer visits compared with the previous year. In the same period, 129,449 fewer books were issued.”. Usage has gone down by 20%. Isle of Wight – Skeletons have a tendency to rattle – Alan Gibbons. David Pugh, leader of the Isle of Wight and proponent of volunteer-run libraries was reported in the Mirror many years ago in a suspected vote rigging incident. Shropshire – Innovation key to survival of libraries – Shropshire Star. “The county’s libraries have escaped swingeing cuts in the latest review of services by Shropshire Council. But Councillor Keith Barrow has warned that if libraries do not move with the times, they may not come through any future cuts to council budgets unscathed.”. 2 mobiles have been stopped. Warwickshire – Final chapter but Gail had a ball – This is Tamworth. Successful small Dordon library that “bucked the trend” in usage is closed, passing on to volunteers. Librarian looks back at her years there. Gloucestershire County Council, who last year lost a court case when they tried to push through severe cuts to their public libraries, have released the results of their latest public consultation. It is clear from the questions asked, and from the resultant publicity, that the council appears to be trying to push through very similar cuts this year. The Council argues that it shows the public are on their side in this, and so far the figures quoted do indeed appear to do so. Campaigners argue that the Council produced a slanted questionnaire and have chosen to highlight only the points very favourable to their own view of the need to cut over a quarter of the library budget. Councillors have given themselves just a week to read the consultation before what some observers suspect will be a rubberstamping of the cuts. If they do so, library users in that area will have to consider whether they can afford to fight them once more in the Courts. At their own expense. While Ed Vaizey, the minister who should be taking action, does nothing. there is overwhelming support for retaining the mobile library service, a service that Gloucestershire County Council would have been scrapped almost a year ago if not for tireless campaigning. FoGL expect them to now to be granted a reprieve. the consultation report states that the cuts will have disproportionate impact on the elderly who are “twice as likely to expect negative impacts as a result of the implementation of the strategy”. This is very important considering the reasons why the Council lost the court case last time. The statistics Gloucestershire County Council quotes, in an effort to justify the cuts, need to be considered with caution, as they do not provide the full picture. For example, the consultation report shows that there was particular opposition to the community library proposals in Minchinhampton Library, Lechlade Library and Brockworth, 3 of the areas that are set to have their county library service withdrawn and replaced with the volunteer run model. “It’s just not realistic to talk about a vision for the future that excludes ‘current issues’. The ‘current issue’ is that libraries are being closed all over the country and their real-estate sold off. Even those not being closed are having their book-stocks decimated, their opening hours cut, their knowledgeable staff fired, their quiet spaces for study eliminated, and their inefficient business practices allowed to continue unchallenged. These are decisions made by local authorities whose members neither understand nor use libraries. So I fear that in asking for a vision of the future for libraries, the Arts Council are inhabiting something of an ivory tower. Also, that awful word ‘conversation’ smacks to me of ‘faux democracy’. We don’t want a ‘conversation’ or another ‘report’ – we want some central leadership and we want it now before there is no library service left at all.” Amanda Field, comment on Envisioning the Future. North Somerset – 1 more under threat – Backwell Leisure Centre “Library Access Point” to close in April, replaced by mobile. £347k cut to service. Overall opening hours cut by just one hour for whole authority due to increase in self-service, volunteers. Warwickshire – Cuts in opening hours from April 1st. Kingsbury Library closed, replaced by mobile. 12 branches to be volunteer-run by end of April. Gloucestershire – Outcome report: Focus group meeting as part of the Libraries Consortium held on 13 February 2012 – Gloucestershire Council. Gives some insight into councillor’s viewpoints. Interestingly, two fairly contradictory bits from this: “Members felt that it was not the role of the library service to be an education or social service” and “There was agreement that access to libraries/books was important. Books can help both with educational development and also general wellbeing. North Somerset – Nailsea library new hours from September – Nailsea People. Full breakdown of cuts, some of them quite serious. Arts Council England (ACE), the quango with some responsibility for public libraries, has opened the next stage of its consultation into the future of public libraries. This is likely to be influential in shaping the political debate and is thus not to be ignored. Having said that, long-standing lovers of libraries point out that we have been here before. Library campaigner Desmond Clarke is concerned that the consultation may just provide another “classic ministerial excuse for not acting” that Mr Vaizey himself called the previous government’s Library Modernisation Review. Mr Clarke further points out that “Some of us have seen and been involved in several “conversations” including Framework for the Future (2003), Better Stock, Better Libraries (2006), Blueprint for Excellence (2007), Future Libraries (2010) as well as consultancy reports from PwC and PKF, and have submitted evidence to the two Select Committee Reports and the All Party Library Group. There have also been reports funded by Laser looking at the issues. Meanwhile, the public library service is allowed to decline in many communities while The DCMS, the SCL, the LGA, the MLA and now ACE continue with their “conversations”. When can we expect to see some political and professional leadership to ensure that an improving, comprehensive and efficient service is provided in all 151 authorities in England?”. It’s also disheartening that the site is clearly not for those with local library issues but just for experts and those connected to the internet and in the know. Rather surprisingly, the most important people in any debate – concerned members of the public – are pushed towards local councils, the Library Campaign and Voices for the Library websites where, it is suspected but not yet confirmed, they will be ignored by the consultation. The ACE site is designed or commenting on the particular blog entries. The main site says “we encourage people to respond to guest blog posts and contribute to the conversation via Twitter using the hashtag #ACElibraries. Responses to the independent guest blogs will feed into our overall programme of research and debate, and help us to form a longer term vision for libraries”. This means that ACE can direct the debate in precisely the directions that they want. They also seem especially interested in the small part of the population who use Twitter. Which seems slightly non-socially inclusive but is in keeping with their greatly reduced budget, as is their use of free blogging software for their website. It’s also more inclusive than the first phase which asked 200 “sector experts to participate in a Delphi survey that asks respondents to consider a series of statements about how the country might look in 10 years time”. A “Delphi” survey, incidentally, is a posh way of saying that one is asking a group of experts about the future and the answer is the average of the reply. The next stage of the consultation are workshops held in different locations across England in mid May with the final stage testing “the public view of the purpose and value of public libraries” will be undertaken between June and late September 2012. Therefore, we are in the early stages of a fairly thorough six month process and you don’t have long to comment on this stage. Have a look, comment where and when you can, tweet your views with thier hashtag if you can, and try to shape the results the way you want them to. Or Ed Vaizey will say that you had your chance and he will continue to do nothing, in exactly the same way as he criticised Labour for doing two years ago. Guest Blog 1: Libraries and social justice by John Vincent, the Network – Need to focus on the power that libraries have on levelling inequalities. Libraries have a “fundamental” role. The Network is a website that supports libraries, museums etc in tackling social exclusion. Guest Blog 3: Focusing on poverty is risky but necessary, Jonathan Douglas, National Literacy Trust – Average income expected to fall by 7% by 2020. “Libraries have always had a bias to the poor” so the “prize is great”. … “they can turn lives round, boost relative social mobility and even stop the newly enlarged poverty footprint in the UK becoming intergenerational. They will also demonstrate their indispensible role in UK policy.”. Libraries need to prioritise those on low incomes and the vulnerable at the expense of other targets. Beyond the BookShelf – University Business (p.12-13). Suggests linking university and public libraries and emphasises the need for using technology. “In this country we all believe that healthcare should be free at the point of delivery. Literature, stories and poems are the same. It is not something just for rich, educated and privileged people, it is for all of us. It is our culture. Robert Louis Stevenson and Enid Blyton and Roald Dahl’s stories are for everyone, not just for everyone who can afford a book.” Michael Morpurgo in “Like the NHS, libraries are a vital free service for all” – London Evening Standard. Public and academic library closures in the US, UK and Eire, part VI – Examiner (USA). Looks at the lack of coverage of National Libraries Day in Kent, Croydon etc. Also looks at the role of the LGA which “made the breathtakingly irrational statement, “Closure of a library does not automatically mean a decrease in access to library services; with the exploration of on line and community delivery models, it can mean accessing services in a different way”. Cheshire West and Chester – Library staff have c.5% cut in pay on top of 3 year’s pay freeze. Worcestershire – Opening hours cut (inc. Market Place Redditch 2.5 hours, Woodrow 1 hour, Wythall 4 hours), 28 to 30 full-time posts to go. perhaps another £10k in “on costs” like pensions) and, interestingly, is permanent. Isle of Man – Funding hope for libraries – Manx Radio. “This morning in the House of Keys, Education Minister Peter Karran revealed they may yet be saved through other means of funding. That is rumoured to be coming from Island-based e-gaming firm Pokerstars.” [yes, Pokerstars – did things just get surreal? – Ian.]. Worcestershire – Library opening hours cut – Redditch Standard. “”This is a type of small change that allows us to continue with a comprehensive library service across the county and although reducing opening hours in some of our libraries isn’t something we’ve done lightly, it’s clear that a slight reduction in service is better than complete and outright closures. We believe these measures will ensure we achieve our financial objectives in a way which inflicts the least disruption to our valued library users.” [Losing at least 28 full-time posts is not “a small change”. It’s a large proportion of total staffing, probably a guesstimate would be a quarter – Ian.]. “As you will know if you have been following our campaign. I am an academic librarian and we have had a lot of support from a very knowledgeable retired public librarian. But we are two of many, As the letter, says, our campaign was supported by 16,000 signature petition (gathered in just 3 weeks in the face of extreme winter weather). Our campaign has been strong because we have library users from all different backgrounds working tirelessly to save our libraries ( as DCMS will know from the hundreds of letters they received, and ignored, from library users in Gloucestershire). Librarian or library user, we have all taken the same stance as expressed in my letter (just look at the evidence from Gloucestershire sent to the CMS Select Committee for more!). I find it a bit odd that I am attacked for defending a library service just because I am a librarian. We are damned if we do, damned if we don’t! I personally would like to see more librarians, alongside library users, fighting for the service. ” Johanna Anderson, Friends of Gloucestershire Libraries. Letter to campaigner – Alan Gibbons. Response to Eoin Garland from government regarding unfair reliance on volunteers, fragmented approach to libraries, poor record of government on libraries. Libraries are not just buildings full of books – Unison “In Focus” magazine, p.13-14. Article on the Speak Up for Libraries event, including quotes from several public librarians and Alan Gibbons. A full response, no the normal form letter, but with no new real information. video where she calls them the “second most sacred physical space”. Calderdale – 1 mobile to close on 1st April, large number of opening hour reductions. Calderdale – Library opening hours cut to save £150,000 – Halifax Courier. Cuts in hours at “Brighouse, Elland, Hebden Bridge, King Cross, Sowerby Bridge and Todmorden libraries will open for 37 hours a week; Rastrick Library for 30 hours; Beechwood Road, Hipperholme, Northowram and Skircoat libraries for 25 hours; and small changes will be made at Mixenden and Shelf libraries.”. Mobile library will end, to be replaced by a “Home Library Service” for the housebound. North Somerset – It’s time take a stand for quality – This is Bristol. “New books which expand the mind seem rarely to be bought; the latest popular fiction is. I feel the Library Service has lost its soul and seeking justification for its existence, veers towards pop-marketing in imitation of the big bookshop chains, the fast food of the printed word.”. Also, letter is against just the free market providing books. Portsmouth – Plans for Drayton library approved after 50 years – News. “Following the launch last year of a popular library in Palmerston Road, Southsea, the city council is pushing ahead with plans to repeat its success in Drayton. Officers have identified the area as the only one in the city without a public library within a mile of residents’ homes and said calls for one began more than 50 years ago.” … “Both major political parties have taken credit for the idea”. The chief of Arts Council England (ACE), the quango with some responsibility for libraries, has been told that she will not have her contract extended from January next year. There’s a fair bit of controversy over Jeremy Hunt’s decision to do this. Liz Forgan has been seen as doing a good job leading the organisation at this most difficult of times. The suspicion is that her leftwing views, which have never apparently interfered with her work, was the real reason. More worryingly for libraries, perhaps, is the stated reason: Mr Hunt has specifically said that the new leader needs to aim for more private sector funding. Privatisation and libraries are not the most clear-cut or uncontroversial of bedfellows and a pro-private anti-public new boss of ACE is unlikely to do the service any favours. It’s a shame also as the Arts Council has been showing signs of making positive steps recently, most notably in starting on doing a decent job of surveying the sector. In another way, though, the organisation is incredibly weak and nowhere more so than in funding: the Welsh Government, despite being seventeen times smaller than its English neighbour, is providing more than four times the funding (over £1m) for eight branches in Wales than ACE (£230k) is providing for the whole of England. Some though may fear that getting the necessary bread from MacDonalds (or Amazon?) may though be worse than the current famine. Coates blasts UK library service as Bilbary launches in US – BookSeller. E-books site will share profits with US library services but not with UK libraries as they are “not organised at all” as there are over 150 different authorities. Instead, some profits will go to local campaign groups. Comment from Friends of Gloucestershire Libraries [by Jo, who is an academic librarian] points out that they are not campaigning to control their libraries but, rather, for the Council to keep running them themselves. “We argue that breaking it up by cutting “individual sites” off so they are run outside of this network, by volunteers, is counter-productive, unsustainable, inequitable and a massive leap backwards”. “This is seen by many to be a political decision as Forgan is perceived to be left of centre, was appointed by Labour and is the chair of the Scott Trust, which owns the Guardian and the Observer! Hunt wants to appoint someone with experience of private funding as he sees this as a future priority for ACE. A worrying sign of things to come?” The chair of ACE told to step down, a political decision? – Stop the privatization of UK public libraries. Derbyshire – 15 branches now have self-service. Duffield and Whaley Bridge are having “major refurbishments”. Dorset – £2m refurbishment of Christchurch Library. Neath Port Talbot – £114k grant from Welsh Government for improving Baglan inc. children’s, events, wifi. Brent – Labour loses Dollis Hill seat to library campaigner Alison Hopkins – Preston Library Campaign. “It is clear that a huge number of Brent residents are still very angry at Labour’s decision to force through the closure of half of our libraries in the face of massive public opposition.”. [The newly elected councilor is the Neasden representative on the Brent SOS libraries campaign and collected hundreds of signatures protesting against the library closure.] Alison, retains the seat for the Lib Dems. Brent – Big drop in visits and usage since closure of six branch libraries. First column is March 2011, second is February 2012. Cheshire West and Chester – Union action to close Northwich libraries – Guardian series. “Librarians will walk out in protest against changes to their contract terms and conditions.”. Croydon – Half-baked news of Croydon Libraries bidders and campaigners concerns – Save Croydon Libraries Campaign. “No one debates that the local press must have great difficulty verifying the real situation as Cllr Sara Bashford and Croydon Council are almost silent on the matter, pushing through the privatisation of all thirteen libraries, knowingly having only consulted with the users of less than half the libraries in the network.”. Concerned over private companies making profit from libraries, lack and poor quality of National Libraries Day events. Shortlist of companies bidding to run Croydon libraries revealed – Guardian series. Lists names of companies and briefly describes them. LSSI quotes as saying “No longer will libraries simply sit and wait for their customers to arrive. They will be more proactive, more outgoing and offer the range of educational, leisure and cultural services that their communities demand.”. Surrey – Library funding fight heard at High Court – This is Surrey Today. Summary of the main arguments used. Library closures and the public sector equality duty – Elisabeth Laing QC. “Elisabeth Laing QC gave this paper at the 11KBW Cuts, Closures and the Public Sector Equality Duty – developments, particularly as applied to library closures seminar on 21st March 2012”. Examines recent public library legal cases. Points out possibility of challenging closures under new Localism Act legislation. See also The Public Sector Equality Duty by Joanne Clement. Professional development advice for academic librarians – Guardian. Long article with relevance for public libraries as well. Speak Up for Libraries – We Heart Libraries. Summary of the day, along with some great pictures. Camden – Most libraries will have one hour less opening per week, although Queen’s Crescent Library will close more. Lincolnshire – New Threat: Saxilby Library to be closed, with some of its books to be moved into a community centre, with bar staff and volunteers expected to fully replace paid library staff. North Lincolnshire – £16k cut by cutting Scunthorpe Central Library by 4.5 hours, Ashby Library will be open 5.5 hours less. Barton Library will be open longer but on an unstaffed basis. Lincolnshire – Villagers threaten to boycott new library at Saxilby over staffing – This is Lincolnshire. “But villagers have vowed not to use the facility. They argue the new site will no longer have the personal touch because all three of the current library’s staff have been asked to work elsewhere. Instead, the new library will be managed by bar staff already employed at the community centre. There will also be self-service machines. Campaigners also say the use of a bar, local sports clubs and fitness classes at the centre will lead to noise and “rowdy behaviour”. Wirral – Hoylake: then and now – BBC Things To Do. “Local historian Jim O’Neil will be talking about his new history book, “Hoylake Then and Now” which compares old and new photographs and provides a fascinating insight into the town’s past.” at Hoylake Library. In the Surrey judicial review, the council’s defence included the claim that volunteers give “equivalent service” to paid library workers. It was pointed out by the council’s barrister that the affected employees were not professional librarians. She went on that some of the volunteers thought it was “offensive” that campaigners would think that they could not do the work. It is unclear when the judge in the case will give his verdict, which the campaigners think is “difficult to call“. There is a new chairman for the Industrial and Provident Society taking over the running of public libraries in Suffolk. This seems to good news, as the previous chairman, Clive Fox, did not seem to particularly impress those concerned with public libraries. The new chair, according to reports, is made of better stuff. We shall see. Whatever the case, and I would not like to say if Mr Fox was pushed or went of his own accord, this has to been as a shaky start for the experimental governance of a county’s library service. An authority’s public library service deserves better. Navigating your library through the “perfect storm” – Ken Chad Consulting. Interesting presentation on strategy and what libraries need to think abut in getting one. “It is with this objective in mind that we recently commissioned a National Mission for Libraries, anchored in our Ministry of Culture. The Mission will focus on improvement of the public library system of the country particularly concentrating on the states where library development is lagging behind,” [Shame this quote is from India]. “As for Ed Vaizey one can but hope that when DC shuffles the Cabinet, something he hasn’t done yet, that he’ll get his comeuppance. Rarely says anything and what he does say is rubbish.” Mr G Metliss, Richelieu, France. In email. [Mr Vaizey’s record is now international]. Suffolk – Sudbury Library merged with tourist information centre. Croydon – No favourites on Croydon’s short-list for library sell-off. Oh no – Inside Croydon. Run-down on the five “preferred bidders” for the borough’s libraries. The internal takeover bid has been rejected. Booked Up, the national scheme that ensured every eleven year old was given a book, has ended, to be replaced by a scheme which will require participating schools to pay £2.50 per pupil. I was involved in promoting Booked Up to my local community for the last few years. I can confirm that it encouraged a lot of children to read, just as they were entering that difficult secondary school phase … and every child got a book, regardless of the institution’s ability to pay. Now that the perfectly good replacement scheme requires a payment, which is hardly surprising in these cash-strapped times, another avenue for equality of opportunity has gone. It follows on from the attempted complete withdrawal of funding for BookStart funding slightly more than a year ago, which was abandoned after major protests. If this decision stands – and it is likely that it will – more “Argos catalogue families” (where the only book in the house is the Argos catalogue) will be the result. Another step will be taken towards a world where books are only for those children whose families can afford them. Some more information from the Surrey judicial review has been released. The major campaigner argument against moving ten libraries out of council control is that the council duties under Equalities Act were not properly undertaken. This is similar to the argument that was successful in the Gloucestershire/Somerset judicial review. The council response appears to have boiled down to “a volunteer-run library is better than a closed library”. It is unclear at the current time as to when the court’s decision will be announced. Booked Up withdrawn – Teen Librarian. “Booked Up gave every 11-year-old in England the chance to choose a free book during their first term at secondary school. The aim of the programme was to support and encourage reading for pleasure and independent choice. Year 7 students chose their free book from a list of specially selected titles.” 3.25m books distributed over five years. No more. Replacement programmes require schools to pay £2.50 per child. “One of the best schemes for encouraging reading has effectively finished. So sad” … “Most school librarians would therefore pay about £500 for books to give away and not for all to enjoy. What are your thoughts?” Heart of the School on Twitter. “In 2010 Booked Up reached over 650,000 children in over 5,000 secondary schools. 73.5% of Coordinators reported that they see evidence of students wanting to read more for pleasure as a result of Booked Up. 56% of students are visiting bookshops more often since Booked Up” Orchard Books blog. Libraries under pressure – Voice of Russia. “Britain is reducing the number of public libraries under the pretext of lack of patronage by readers. Protest meetings have been held in London. The situation in Russia is also of serious concern because not all the libraries can compete with the Internet for the dissemination of information. “. Only 20% of Russian libraries have internet access. … “For a long period of time, the libraries were not bothered by competition, the rural libraries were not given fresh supplies for years and there are even those which received the latest publications only at the start of the 1990s.” … “In Britain the public organizations encouraging literacy are well funded” [!]. “People who think libraries are going away simply because books are going digital are missing the true tectonic shifts taking place in the world of information. Libraries are not about books. In fact, they were never about books….Libraries are here to stay because they have a survival instinct. They have created a mutually dependent relationship with the communities they serve, and most importantly, they know how to adapt to the changing world around them. I am always impressed with the creative things being done in libraries. As Eleanor Roosevelt once said, “The future belongs to those who believe in the beauty of their dreams.” There are a lot of beautiful dreams taking place that will help form tomorrow’s libraries.” ” Future libraries and the 17 forms of information replacing books – Futurist Speaker. “The mission of librarians is to improve society through facilitating knowledge creation in their communities.” R. David Lankes, The Atlas of New Librarianship. “Don’t forget that tomorrow (Wednesday 21 March) there will be a Library Consultation Meeting in the Old Library building on Knights Hill from 7-9pm. The next one is Thursday 29 March 10am-12pm.” Upper Norwood Joint Library Campaign. Croydon/Wandsworth – And the shortlisted bidders for the Croydon/Wandsworth library contract are … – Stop the privatisation of UK public libraries. “Have just heard that LSSI are one of the shortlisted bidders for the Croydon/Wandsworth library contract, along with Civica, Essex CC, Greenwich Leisure Trust and John Laing.”. Judicial review: a review – Surrey Libraries Action Movement. Main argument from campaigners is that the Equalities Act 2010 is not being followed: “The Claimant’s case in short is that, whereas SCC may have carried out an Equalities assessment of closing libraries, it did not carry out a similar assessment, or any mitigation exercise, based on setting up Community Partnered Libraries. Also, that concerns and adverse feedback about the libraries policy from Disability Empowerment Boards were not brought to the attention of decision makers. And that the answer of, “training will be given to volunteers”, is not enough to show “due regard” …”. Council’s argument is that running a library with volunteers is better than closing it.